1. Ricochet/Prince Puma-Whether he was under the moniker of “Ricochet” or “Prince Puma” in 2014…”The Future of Flight” had one of the most dominant years in recent memory. 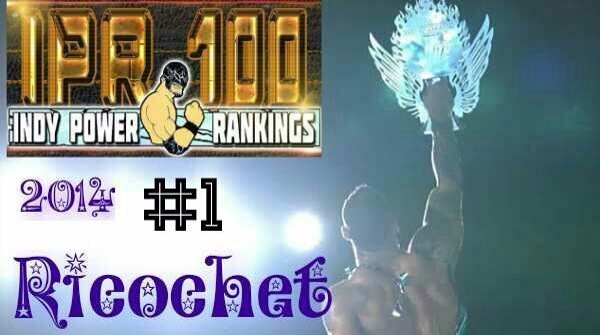 His #1 ranking was only pushed mid-year by Michael Elgin during his ROH World Title run, but was quickly pushed aside when Ricochet continued to rack up more title wins and #1 rankings. He finished the year with 8 number one rankings, 4 number two rankings, 3 number three rankings, 2 number four rankings, 2 number five rankings, 1 number six ranking, and 1 number 10 ranking…along with 7 other mentions where he didn’t quite crack the Top 10. He even did something that most of the top talent had failed to do in 2014 when he won an online voting competition AND was #1 in the same week. In a year where he won the DGUSA Open the Freedom Gate Title, the HOG Heavyweight Title, the Lucha Underground Title, the NJPW Best of the Super Junior Tournament, and PWG’s Battle of Los Angeles, there was simply no contest when it came down to the year-end totals. He jumped up 25 spots from his ranking of #26 in last year’s IPR 100. Hail to the king. 2. Michael Elgin-Last year’s #1 came up short of repeating at #1 in the 2014 IPR 100, but he still put up a solid effort. It was a year where he carried the ROH World Title from 6/22/14 to 9/6/14 and also was also ½ of the AAW Tag Team Champions along with being the AIW Absolute Champion until 9/7/14; it was a very consistent year, which is his strong suit. Last year it was his consistency that helped him grab the #1 spot in the IPR 100, while this year his consistency combined with big wins such as his IWA Mid-South Strong Style Tournament and AIW JLIT Tournament win that secured the #2 spot for him. He also continued to have fantastic matches where ever he went, which should not be overlooked despite the kayfabe nature of our lists. It appears that he will miss out on the 2015 IPR 100 due to his exclusivity to ROH, but we certainly wish him all the best. 3. Kongo Kong/Osyris-The biggest jump in this year’s IPR 100 comes to us from “The Monsta” who dominated the Midwest…and even Canada in 2014. When it comes to mainstream names on the indies, Kongo Kong may not be on the tip of everyone’s tongue, but if you look at his body of work, you’ll understand why he’s ranked so high…not to mention that his fantastic matches left good impressions in all of the official voters’ minds week in and week out. Kong won the IWA Mid-South World Title on 6/29 in a Tournament Final vs. Hy-Zaya and then continued to not only successfully defend the title throughout 2014, but managed to stay undefeated there. The fact that IWA ran weekly shows for much of the year certainly helped his ranking, but keep in mind that he also did well in multiple other promotions as well, even winning a title in Canada on one of his trips to the Great White North. If Michael Elgin was last year’s “Mr. Consistency”, then you could definitely argue that Kong was this year’s after 1 number one ranking, 2 number two rankings, EIGHT number three rankings, 3 number four rankings, 1 number eight ranking, 1 number nine ranking, 1 number ten ranking, and just one time being mentioned without cracking the Top 10. He also won an online voting competition at one point to show that he can be as popular as he is dominant. 4. Matt Cage-While he certainly had a solid second half of 2014, it was the first half of 2014 that belonged to him. “Money” Matt Cage held the AAW Heritage Title along with the SCW Heavyweight Title (in Iowa) for much of the first part of 2014. Though he lost those titles, he bounced back by winning the DREAMWAVE Title on 8/2/14 from Christian Rose. He also added The Zero-1 USA Midwest Title prior to the end of the year as well. With 2 number one rankings, 4 number two rankings, 1 number three ranking, 2 number four rankings, 1 number six ranking, 1 number seven ranking, 1 number eight ranking, 3 number nine rankings, 2 number ten rankings, and four mentions without making the Top 10, he almost ran the gauntlet of rankings throughout the year (the only one missing was a #5 ranking). There’s no doubt that he was absolutely “Money” in 2014 after jumping up 23 spots from #27 in the 2013 IPR 100 to #4 in the 2014 IPR 100. 5. Melvin Maximus-The “Marvelous” former OVW Heavyweight & TV Champion may seem like a name that is a bit out of place to be so high in the year-end rankings (much like Benjamin Kimera last year) but examine his 2014 as a whole and you’ll see a story well-told. While he was largely ignored and not treated with a lot of respect due to him only working one promotion in the Midwest for much of 2014, the official voters were forced to give him respect when he went on a lengthy win streak (upwards of 40+ wins at one juncture) before finally losing a match and then the OVW Title with it. He was always a tough out when it came to losing matches, but when it came to the Top 10, he most certainly was as well after picking up 3 number one rankings, 2 number two rankings, 1 number four ranking, 1 number five ranking, 2 number eight rankings, 3 number nine rankings, and seven mentions without being ranked in 2014. While his 2014 sputtered a bit towards the end, if he can try to match this success in 2015, you may be seeing him quite high in next year’s IPR 100 as well. He was second to Kongo Kong as the highest jump as he was unranked last year and jumped all the way up to #5 this year. 6. Adam Cole-Last year’s #2 falls four spots this year, but still had a VERY good year. While he did eventually lose both the PWG and ROH World Titles, his year was still quite good all the way to his bloody war vs. Jay Briscoe at Final Battle in the main event of ROH’s biggest show of the year. While the former Double Champion dominated two of the most well-known promotions in the U.S. in 2013, in 2014 he branched out and took a lot of his success to the UK and Germany. While he’s currently on the shelf with a shoulder injury, there’s no doubt that in 2015 he will continue to prove that he’s a true international superstar. That being said this may be his last hoorah in the IPR 100 with ROH, NJPW, etc… no longer being eligible, but if he DOES take some other bookings outside of those companies, we could see more Adam Cole (BAY BAY) in the IPR 100 in 2015. Cole racked up 2 number one rankings, 1 number two ranking, 4 number three rankings, 1 number four ranking, 1 number 5 ranking, and three mentions without being ranked in 2014. 7. Uhaa Nation-The “One Man Nation” moves up 3 spots from last year as he ranked #10 in 2013, but enjoyed even more success in 2014. While his Dragon Gate work certainly slowed down, his international work did not…AT ALL. The big man was frequently seen in Europe where he took the continent by storm. Not only that, he returned to the U.S. for a brief period of time and put on several classics in PWG, EVOLVE, etc… It would appear that 2014 was his year, but as good as he is, we expect him to get even better in 2015. The question now is…will we even see him in the IPR 100 next year…or perhaps we’ll see him for a bigger company in Connecticut/Florida? In 2014 he won the PCW Title in the UK and picked up 2 number one rankings, 1 number three ranking, 1 number four ranking, 2 number five rankings, 3 number six rankings, 1 number seven ranking, 2 number eight rankings, 1 number ten ranking, and 3 mentions without being ranked. 8. AJ Styles-This may seem like a very low ranking for “The Phenomenal One” based on what he did in 2014, but consider this, while he did have a very solid run with the IWGP Heavyweight Title, many of his wins in the U.S. were by DQ, countout, or ended in time limit draws/no contests. With all that being said, it was still a “phenomenal” year for a man who is still one of the best in the world. Despite draw a bit of criticism this year, he can still go with the very best of them. In 2014, he did just that in ROH, New Japan, PWG, and several other top companies. Much like several others ahead of him in this year’s IPR 100, he’ll need to score some big wins on the indies outside the “majors” to return to the list next year. Proving that he’s still one of the best in the world, Styles secured 4 number two rankings, 1 number three ranking, 3 number six rankings, 2 number seven rankings, 1 number nine ranking, and seven mentions without being ranked. 9. Shane Hollister-“The Shug” had a very up and down year. The first six months of his year were FANTASTIC with him holding the AAW Heavyweight Title (again) along with the SCW Heavyweight Title in Iowa. He dominated the early part of 2014 in our rankings, proving that it’s not always the “big names” that are getting ranked number one. That being said, his personal life (as it does with many of us) took over a bit in the later stages of 2014 and he slowed his schedule down, but still stayed relevant. He finished the year with an almost career-ending ankle injury, but it appears that he will return in 2015. We hope to see him stronger than ever in our rankings and wish him all the best on a speedy recovery. In 2014 he scored 2 number one rankings, 1 number two ranking, 1 number three ranking, 1 number four ranking, 2 number five rankings, 1 number six ranking, 2 number eight rankings, and 7 mentions without being ranked. 10. Chase Owens-The former NWA Junior Heavyweight Champion had an absolutely FANTASTIC year. Not to pull in too many clichés, but 2014 could likely be considered his breakout year. While he did inevitably lose his title on his second trip to Japan, he still had a TON of success in the United States and Canada in 2014, defending that title (and winning other titles) everywhere he went. While he didn’t win the match, one of his defining moments in 2014 was getting to step in the ring with Jushin ‘Thunder Liger in Japan. With as much success as he enjoyed in 2014, we truly believe he’ll do everything in his power to build on that success heading into 2015. In 2014 he was voted number 1 three times, had 2 number two rankings, 1 number four ranking, 1 number five ranking, 2 number ten rankings, and 7 mentions without being ranked. As we did last year, we announced the 2014 LIVE on Weekly Wrestling Podcast. This year, we announced the Tag Team Top 50 LIVE on Filling the Void Radio Network with HUGE guests coming on to get their rankings and talk about their 2014 & 2015 coming up. Rather than have us explain every ranking to you, it’s best to listen to the shows! Our Instagram where we SPOIL the Indy Power Rankings/Tag Team Top 5 every week!